Get OEM quality with the value that a trusted compatible toner offers. Formulated to resist fading, keeping text and images crisp. Each cartridge is tested prior to shipment to ensure your satisfaction. Supply Type: Toner Cartridge; Color(s): Yellow. 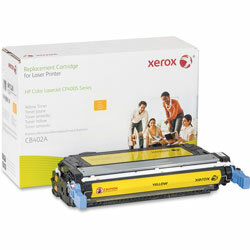 Yellow Laser Toner Cartridges from Xerox! 6 In Stock today.